Sporting facilities available to the community are golf, tennis, squash, basketball, netball, badminton, soccer, cricket, horse racing/riding, camel racing, shooting, swimming, motorbike and horse sports (gymkhana's), pony club and more. The Boulia Sports and Aquatic Centre boasts a large indoor/outdoor facility. The indoor facility has a large sports hall which accommodates 4 ball sports including basketball, volleyball, netball and badminton. Combine that with 2 squash courts, a fully equipped gymnasium and children's playground and you have a pretty fantastic centre. A 25 metre swimming pool, two tennis courts and grassed sports oval which is fully illuminated by lights for night sports and you have a state of the art facility that is one of a kind in the north west. A water bubbler park is open to the public from 8am-8pm all year round. The Boulia Golf Club situated approximately 2km from town boasts an 18 hole sand green course and can be proud of its modern air-conditioned club house. The club holds regular golf days on Sundays and everyone is invited to come along and play a round. A well maintained grassed Racecourse/Rodeo grounds is owned and maintained by the Council. Two main annual events are held at these grounds throughout the year as follows. The Boulia Rodeo Association and Boulia Turf Club hosts their annual Rodeo, Races & Campdraft every Easter weekend. Saturday morning starts with the Time Events and then the reins are passed to the Boulia Turf Club who hosts a spectacular day of racing that attracts entries from Mount Isa, Winton, Cloncurry, Bedourie, Birdsville and other centres with bookmakers catering to every punter. Sunday morning rises with cowboys and cowgirls all trying to win that much sought after Boulia buckle with rodeo events lasting well into the afternoon. Top all this off with live entertainment, full bar, operating kitchen and camping included in your entry fee and you have a great weekend in store. The Famous Boulia Camel Races is held every third weekend in July. This event draws crowds in their thousands to watch camels race around the track to win that elusive Boulia Camel Cup. Saturday consists of 8 races, live entertainment and fireworks. The finals are held on the Sunday morning and everyone can feel the tension as they line up for the cup. Bookmakers are on course all weekend as well as markets, full bar, kitchen operating and camping included in your entry fee. This is Australia's premier camel race and the longest cup final of 1500 metres. 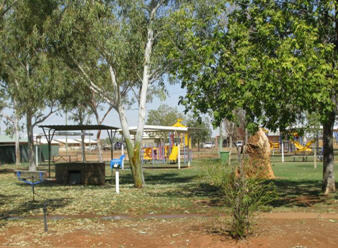 Robinson Park is located on Herbert Street within the Boulia Shire. It is open to everyone at no cost and contains toilet facilities, children's play equipment and an electric barbeque. A skate park is also located in Robinson Park.